Happy Monday! For those of you who seen my Confessions of a Secret Snacker post that went up yesterday (read here) you will know that I let the healthy eating slip last week. While I did blame the good weather, I know it is my own mindset that is behind it all. I finished the week off in style aka with a take away and plenty of chocolate and started Monday with a fresh head. We all have our down days or in my case weeks, but life is all about balance and getting back on the wagon when you fall off! 1. Don’t over do it – Mondays are hard. Don’t force yourself to over exercise and eat too little to make up for your bad days. If you’re exhausted and hungry you are much more likely to grab that bar of chocolate or packet of crisps. I like to ease myself back into my regime for the first few days. 2. Let go of the past – if you keep feeling guilty about your bad days, then you’re not focusing on the good things ahead. Stop dwelling over the things you can’t change and focus on having a Happy & Healthy week. This can be applied to all aspects of life, not just healthy eating. 3. Write a list of what you want from the week – Yes I know, I love my lists! 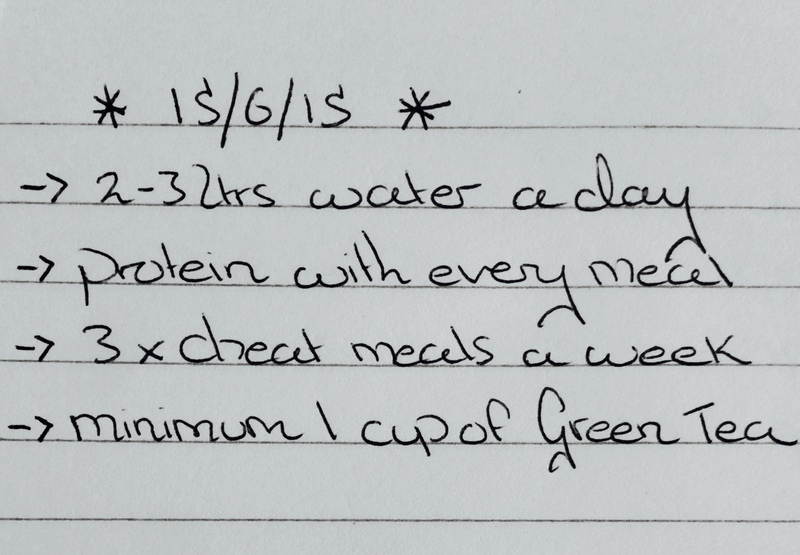 What I did this morning was write a list of what I wanted to achieve this week in terms of healthy eating. I’ve hurt my foot so I’m focusing more on the eating side than exercise for now. 4. Eat enough – I always find that after a week of eating more than usual, my appetite is noticeably bigger. Instead of worrying about how much I’m eating or the calories consumed, I eat as much healthy food as I want. The following week I will be back to looking at portion sizes. Being hungry always leads me to the biscuit press. Also a hungry Zoe is not a happy Zoe nor a pleasure to be around, so it’s in everyone’s best interests for me to stay full! 5. 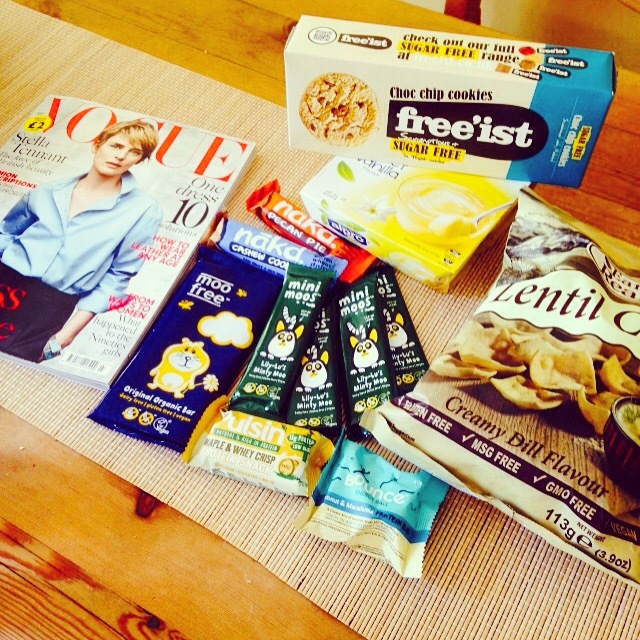 Allow yourself some treats – I always crave the naughty food more having eaten it the previous week. If I don’t give in to a craving and allow myself a little treat, then I will be right back off the wagon before I know it. Plus life is too short not to have the food you love, it’s all about moderation. 6. Drink more water – we all know this one, but don’t necessarily use water as the tool it is. When I drink more water I feel 100 times better. I’m going to be drinking as much as is possible this week. 7. Reduce the Pressure – I can’t speak for everyone here but I know in my case, I’m the No.1 person who puts pressure on myself. I do believe in dedication and focus, but not at the cost of happiness. Nobody else expects us to look like models with abs and the ‘perfect body’ – so we need to stop putting so much pressure on ourselves. That has helped me probably the most when it comes to healthy eating and achieving balance. These are just a few things that help me get back on track if I’ve had a bad couple of days. Different things work for different people, so I think it’s all about how much we want something. If you have any good tips be sure to let me know, I love this kind of stuff! This entry was posted in Fitness & Food and tagged bikini body, diet, fitness, fresh start, good vibes, health, healthy eating, inspiration, Lifestyle, motivation, new week, positivity, weightloss by ZOELEXA. Bookmark the permalink. Great tips! These principles can be applied to most goals as well 🙂 I especially like #3. You can’t get where you want to go if you don’t know where that is!